What time is it? It’s time for lunch! If you have a preschooler, then you know why that was my automatic response! (Bubble Guppies) Those songs have a way of sticking in your head for hours. Actually it’s time for Themed Furniture Thursday!! 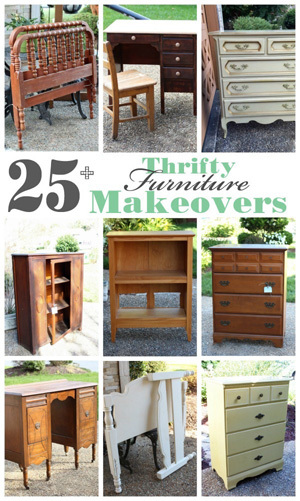 That’s where I and a bunch of my favorite bloggers each make over a piece of furniture, but the catch is, there’s a theme! Because everything is more fun when there’s a theme, right? For $15, I figured it just might work. I shared this pic on my Facebook page on Saturday. Can you see it in there? That was my first official yard saling day of the season! You know black is a stretch for me! The lines of this little table are really pretty though, and I think they show so much better with a little paint. These knobs and scrolled back plate came from Hobby Lobby. 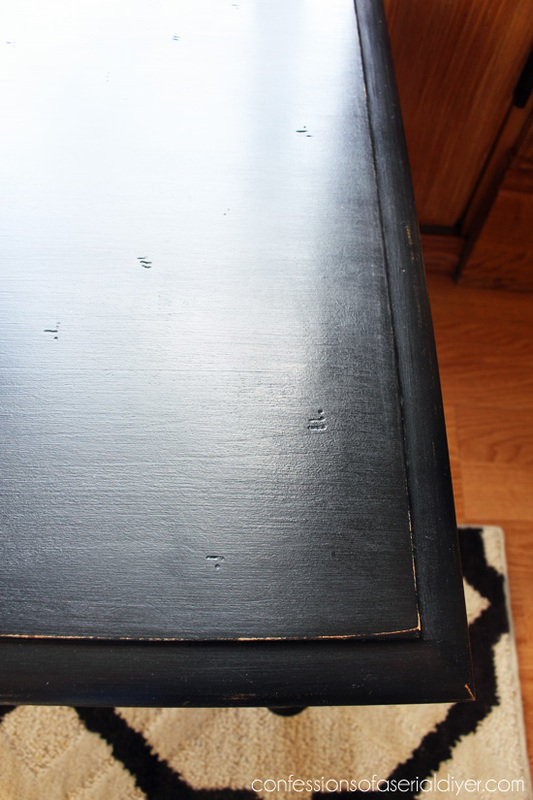 This was my first time making DIY chalk-like paint in black, and it worked beautifully. Which I don’t mind a bit. 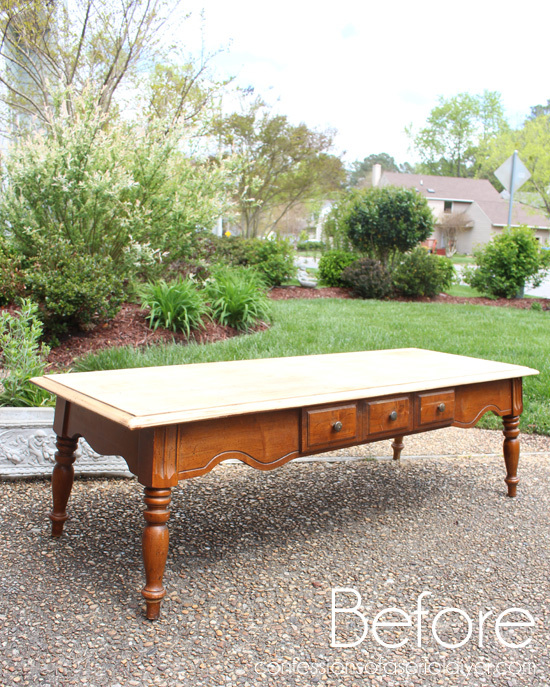 I sanded and waxed using Annie Sloan clear wax like I usually do. You might want to say goodbye to those old laminate floors because it might be the last time you ever see them! My new hardwood floors just came in today!!! I can’t wait to tear all this out! So, what do you think? Does it resemble the PB version? Not if you’re talking about cost, that’s for sure! More importantly, is it an improvement over the before? 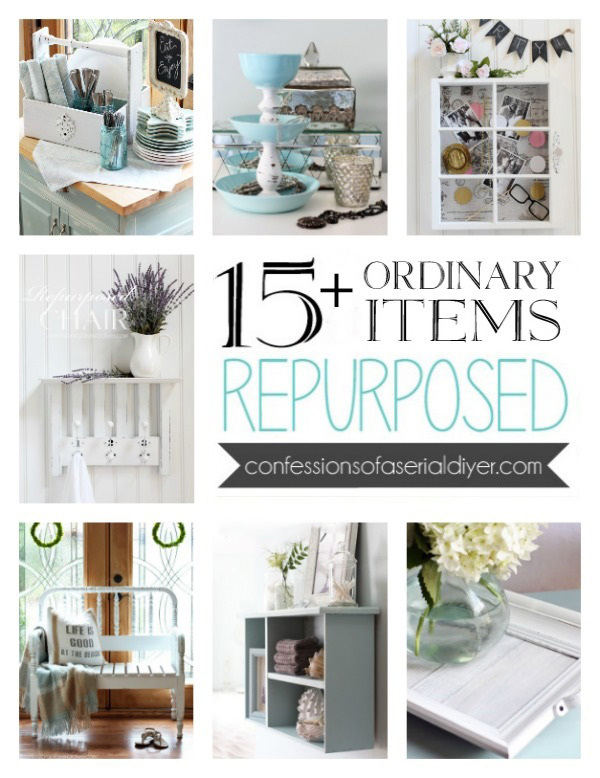 Want to see how my friends were inspired by Pottery Barn? 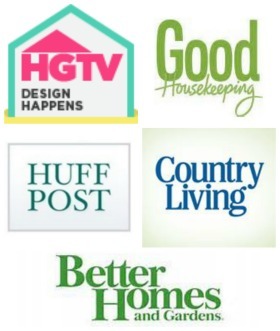 Check their projects out at the links below! This looks great! I LOVE the decision to go with the pretty little knobs and plate. Perfect choice! 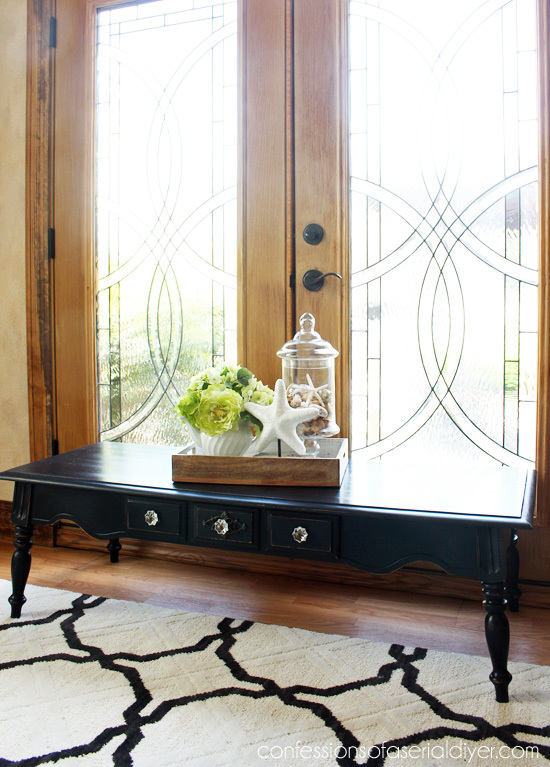 The paint looks wonderful and this looks so good with that rug! I think it looks better than the Pottery Barn table. Love it in black with those knobs. It really shows the features compared to when it was stained. 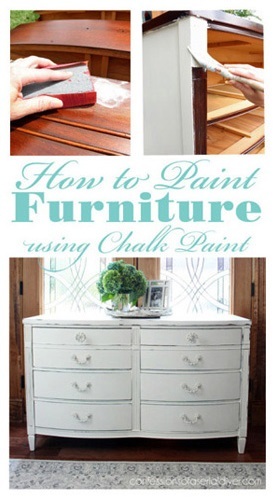 I may have to try the DIY chalk paint. What black paint did you use? So sleek and gorgeous…you nailed it, Christy!! Christie, your table make-over is so much better than the Pottery Barn table. It is prettier and more interesting. I love everything about it, especially the new knobs. It’s a winner. Nice makeover Christy! I love the knobs. And how exciting for you to be having new wood floors installed! I can’t wait to see it! In your headboard bench, you said you used a spray shellac BEFORE painting. How did you get the paint to stick ?? Don’t you usually do that afterwards ?? The shellac was to seal the stain so it didn’t bleed through the paint, and I used milk paint which doesn’t require priming or sanding. It gives a natural chipped-over-time look. 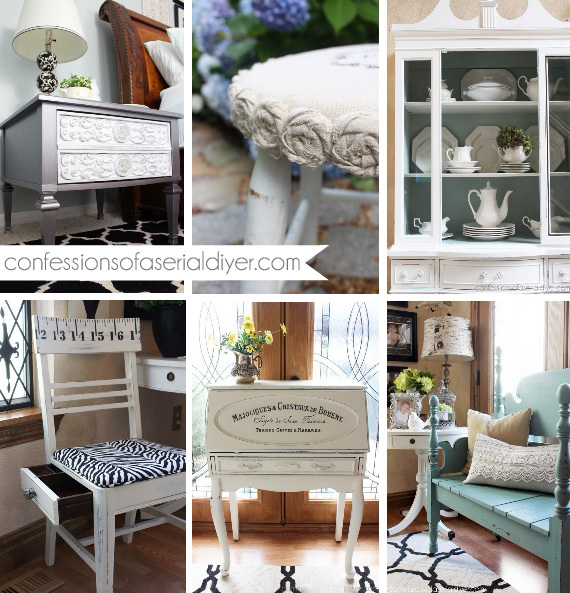 I usually use chalk paint which also requires no priming or sanding and sticks to just about any surface. Thanks for the quick reply. So do you always use this shellac on projects?? 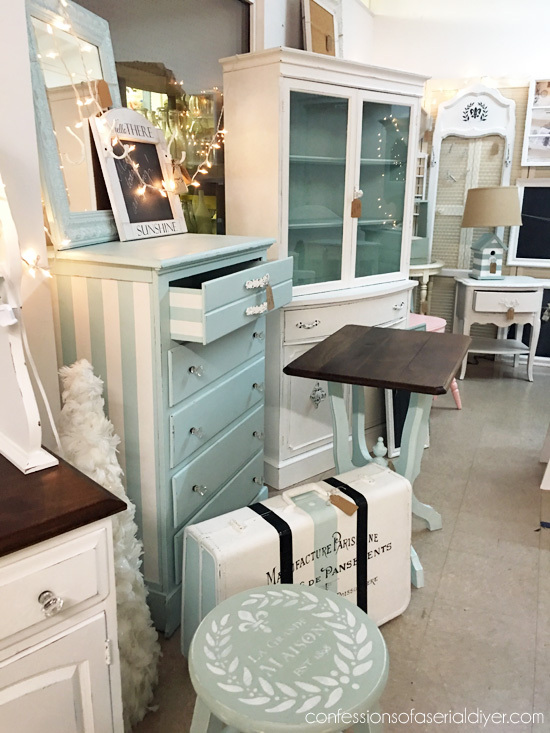 What is chalk paint and where would I find it? I hate sanding… Would this work on kitchen cabinets?? Also would love to make one of these for the back deck, but it is exposed to the elements. What would I paint it with? Yours is the best of all of the PB projects! Great job! Aww you are so sweet, Lori! Thank you. 🙂 I love Pottery Barn, just not the PB prices! Christy I am curious how you handle the drawers. 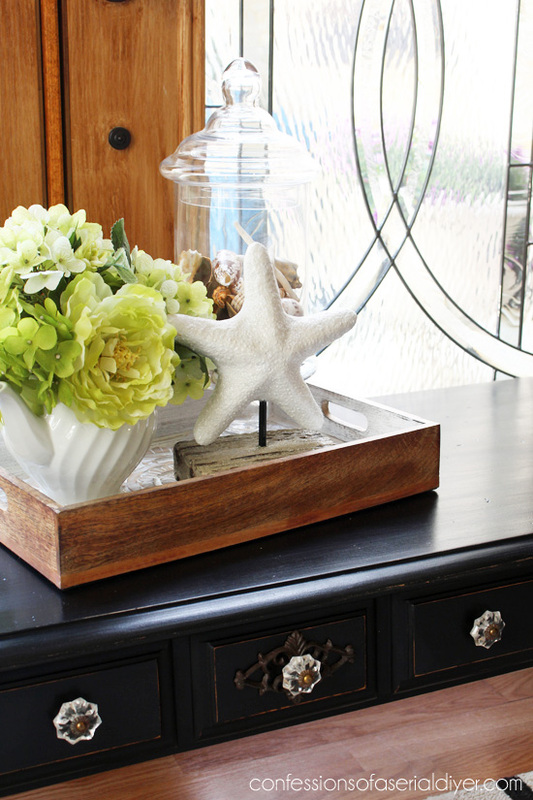 Do you paint the entire drawer inside and out? And if there is drawer slide hardware do you remove it before you refinish? I really enjoy your blog and the work you do. You have inspired me to try some of my own projects. Thanks, Debra! I love hearing that you are inspired to start creating! I only paint the face of the drawers, but I usually line the drawers on the bottom with pretty paper. 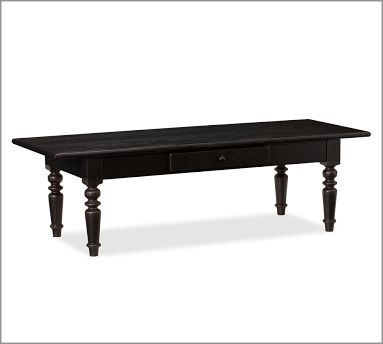 This drawer on this table is fake, but you can see here how I like to do my drawers: http://www.confessionsofaserialdiyer.com/lacy-drawer-side-table/ Hope this helps! 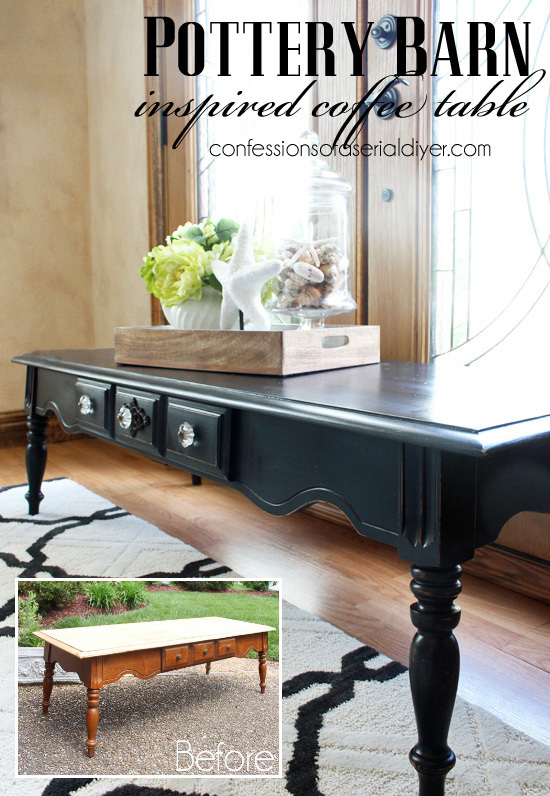 Ah, not only does it resemble the Pottery Barn table but looks way better! 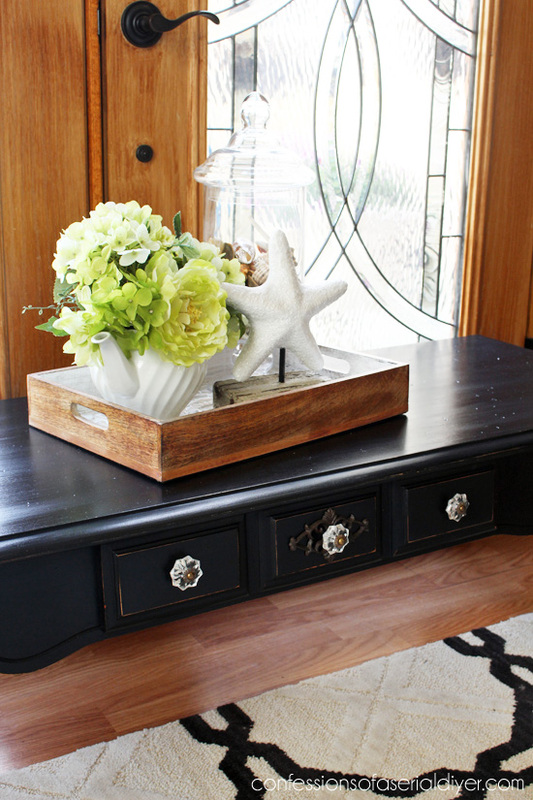 Love your version with those pretty glass knobs. WAY better than the PB version. Genius indeed! I,too, want to know how you treat the drawer inside. Inquiring minds want to know! I love this piece made over with the black paint and it does look very much like the PB version. The knobs that you added are a nice touch. 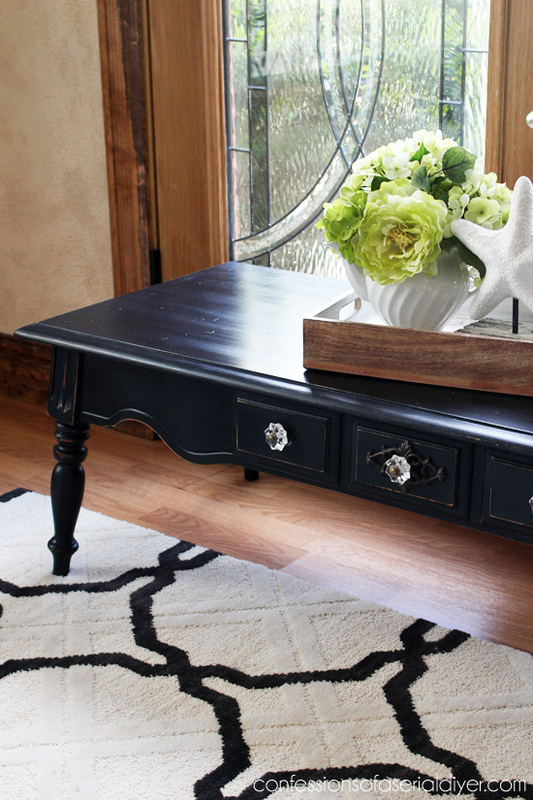 You should start doing more makeovers with black paint if this one sells quickly. Yes and yes. Love it. I think yours looks better than PB. I like the curves on the front panel. You did a fabulous job. Another beautiful job…you amaze me with your creativity. 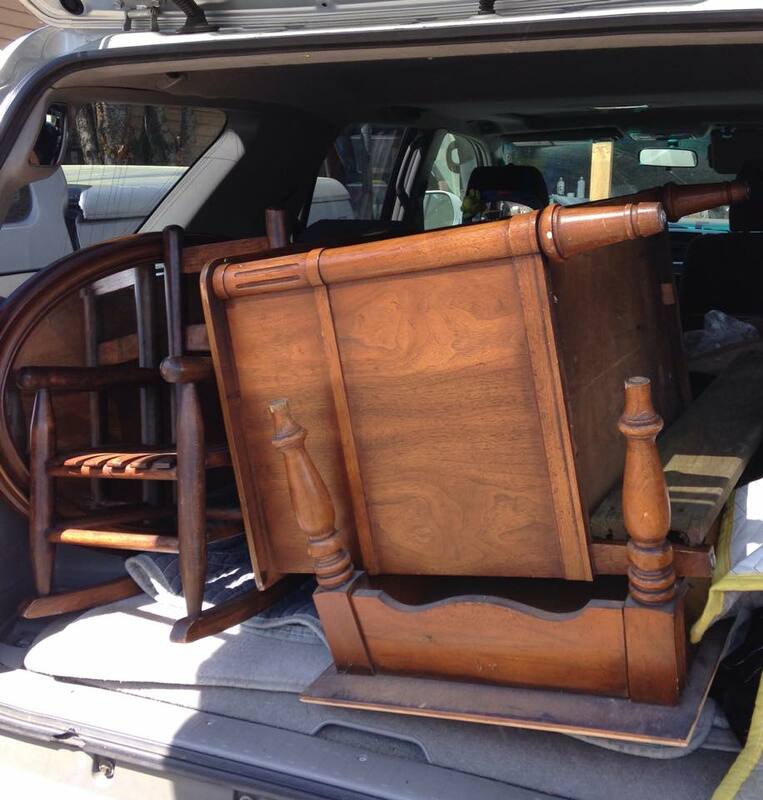 Years ago I hired a lady to redo our oak table, chairs and hutch in distressed black, like your adorable table. With just a little bit of paint It gave the old set a whole new look. BTW…good luck on your new wood flooring. About five years ago we replaced our carpeting with 5″ plank distressed hand scraped dark oak. It took us a month to get it done’ but it was well worth all the hard work and dust. I do love our wood flooring, but what I didn’t know when we installed the flooring was that the hand scraped areas would be an issue…they ended up showing wear marks. And the seams have a bit of a bevel and when I would use a swifter to dust the floors the dust falls into the bevel area. I have to vacuum the flooring…still looking for the perfect vacuum. I don’t think our seams are beveled, but I did wonder about dirt and dust settling into the areas that are lower? I installed Brazilian cherry floors in my last house and they were gorgeous, but they showed every foot print, every speck of dust, you name it, so I was trying to get something that would be easy to keep looking clean! I appreciate your input! I prefer your version to The a Pottery Barn one! They should be following you Christy. The knobs just give the black the lift it needed. It’s really lovely and I’m very impressed with the make-over! What a pretty piece Christy. Black paint along with a talented lady can make anything beautiful! You had me at Bubble Guppies! thanks, now I will be singing myself to sleep with it! 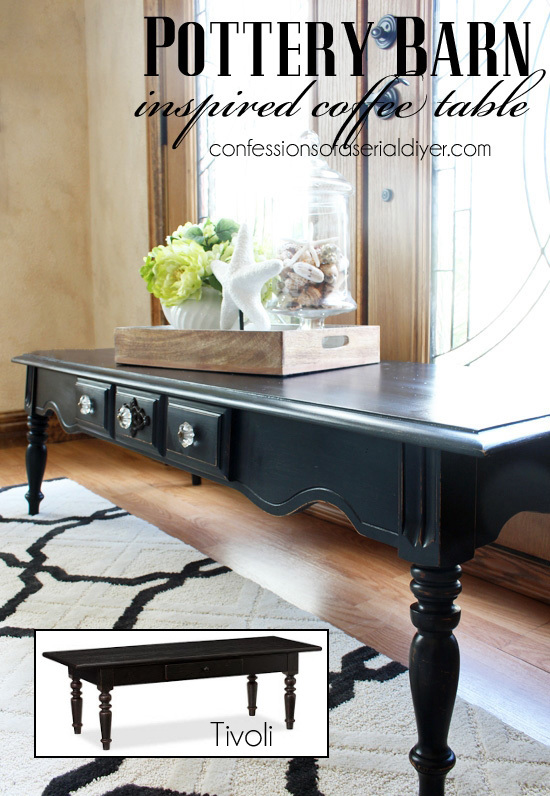 Seriously though, I have always loved the Pottery Barn distressed black look and you did an outstanding job. 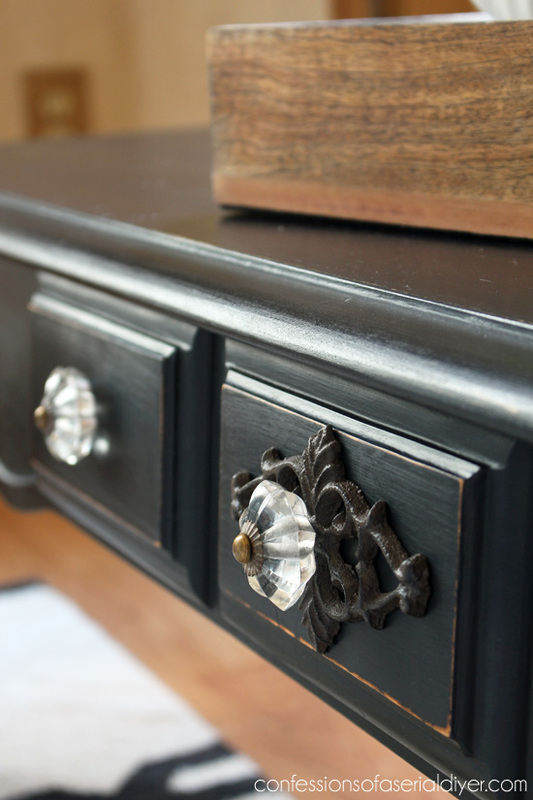 The knobs make it even classier! I love yours even better than the PB version! How is it that every one of your projects seems better than the last? I love them all. You are so inspiring. Wow, Love the all black! 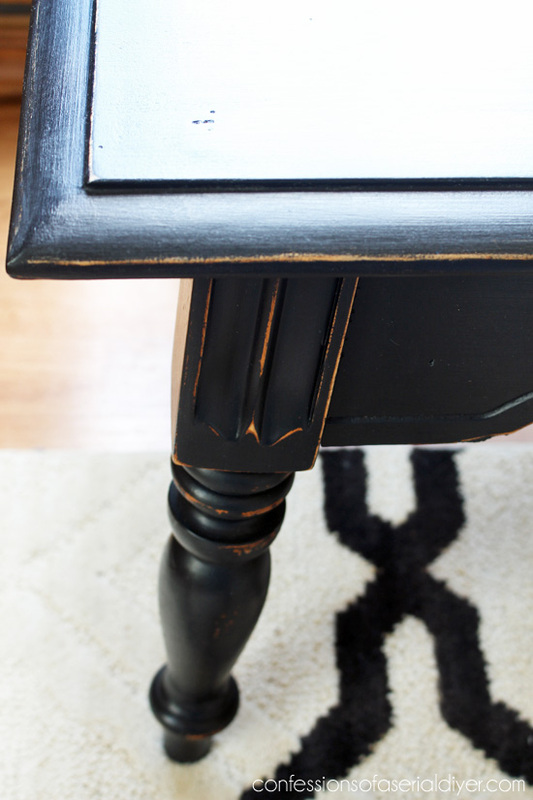 Your table even matched down to the style of the legs! Great find! Great find, Christy! It turned out beautifully! Thanks so much, Jen! I don’t know why I stay away from black! You did such a fabulous job, Christy! I like yours even better than theirs. 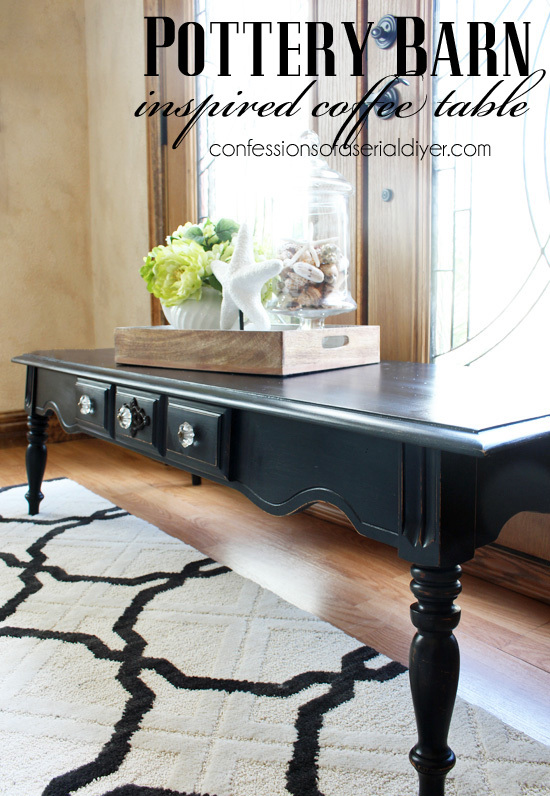 Black was the perfect color and the knobs and plates are just the right touch.